The other day we had a busy stove top. Three of the four burners had things simmering or sauteing or boiling. I wanted to make cabbage, but the last, small burner was hidden among the pots and pans, willing to do the job, but just not roomy enough. I still wanted cabbage, so I looked around and spotted the oven. Of course! Usually I cook up cabbage on the stove top because the oven is busy, so I got a little chuckle about the reverse happening. Okay, so it is not funny, like a gag in a movie or a stand up comedian, but when I think of, say, Thanksgiving when four things need to be baked at once, including the turkey, there is always a wish to have a dish that can be done on the stove top. Okay, not actually chuckle worthy. It was so good I was surprised I had not thought of doing it sooner. Silly. Maybe it is silly. I will stop, because it actually does not matter. This dish is so simple I am not even doing an ingredients list. Just take half a head of cabbage and chop it into one inch pieces. On a large cookie sheet toss the cabbage with 2 Tbsp of bacon grease or extra virgin olive oil (add some salt of you use olive oil). Tossing it is most effective with your hands. Place pan in unheated oven. Turn oven to 350 degrees. After about ten minutes toss the cabbage and bake for ten more. 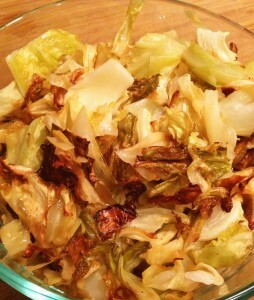 Some cabbage will be darker, beginning to caramelize, and the rest should be soft enough to eat. Serve immediately.